A wonderful celebration of dogs, countryside and wild creatures at a fantastic dog-friendly venue! IF IT IS TOO HOT? Our dogs’ welfare of course has to come first. If it’s hot on the day limit how long you visit for, monitor how your dog is – we want them happy! – or even come without your dog and enjoy and support all the lovely people there. 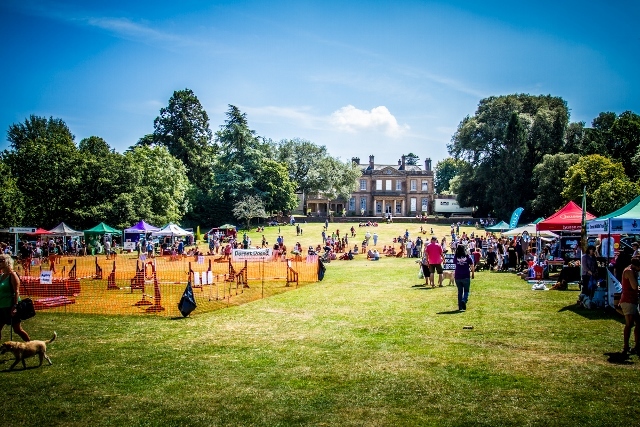 Have-a-go-agility & more activities for dogs, fun dog show, doggy displays, 40 + fascinating stalls, scrumptious refreshments, children’s activities, guided walkies, huge marquee and tree-lined venue for shade or shelter and so much more! Lovely sponsors mean admission to the Festival is once again free this year (although venue parking charges apply, max. £4 per day). Sponsors helping to cover Festival costs are Irene and Mike of I-MAC Fire & Security and Pal4Paws- THANK YOU to them and to dog show sponsors Natterjacks Vets! Guided walkies will start before the Festival stalls open and will be a short one, to avoid potential heat! Other additional measures in place include dog pools, extra water supplies and moving dog show, agility and rally-o rings into tree-shaded areas at the field perimeter. The programme also finishes earlier than previous years as we have moved the guided walkies to the beginning of the day and made it shorter. Hamper prize by Webster’s Empawrium. First 6 qualify for Buckham Fair* Best Rescue / Re-homed championship class. 2.00 Fun Dog Show: You’ve Just Got To Love Me – all comers welcome! Judge Amy with Guest Judges Mike our I-MAC sponsor & Julie from Dorset Dog Delights – she treats us all year round! Finishing off with raffle and a last chance to visit the many stands! There must be something special about Dorset’s fire and security specialists – not only is the main Festival sponsor I-MAC a fire & security specialist, but also KR Fire Safety have let us keep their fire extinguishers for this year’s Festival once again and helpful Aidan who took some resources to Swanage Tourist Information Centre for us works for a fire company too!